Precision lubricant for conductive plastics and carbon-based controls (faders, slide potentiometers, conductive membranes - mouse pads and other mechanisms with sliding surfaces). 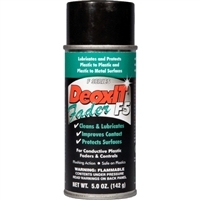 It replenishes lubrication lost on surfaces that have been cleaned with solvents or other cleaning solutions. Use on conductive plastics and other sliding metal-plastic surfaces.Temperature range: -26C to +150C.